Home » Blogs » What's in the President's Rescission Request? Update: CBO released an estimate of the effect of the CHIP rescission on outlays and coverage. CBO estimates that the proposed rescission would not affect outlays or the number of individuals with insurance coverage. President Trump released his formal request for a rescission of funds on Tuesday, calling on Congress to act on $15.3 billion in proposed budget authority (BA) cuts that OMB estimates would result in $3 billion of outlay savings. Rescissions are process under which the administration puts a 45-day hold on spending money appropriated while Congress decides if they want to rescind the money. You can learn about the full rescissions process in our explainer here. The President’s $15.3 billion rescission request comes from a variety of federal accounts. The largest single area the president asks to rescind is $7.0 billion from the Children’s Health Insurance Program - with $5.1 billion from FY 2017 funds that can no longer be spent and the remainder from a contingency account which likely will not be used (similar cuts were included in the bipartisan omnibus spending bill passed earlier this year). The next largest rescission ($4.3 billion) comes from the Energy Department's Advanced Technology Vehicle Manufacturing loan program, which has not created new loans since 2011; OMB indicates that all $5 billion of the Department of Energy rescissions will not decrease outlays. Remaining rescissions come from a variety of government funds and grants across departments many of which were originally authorized for use in prior years. 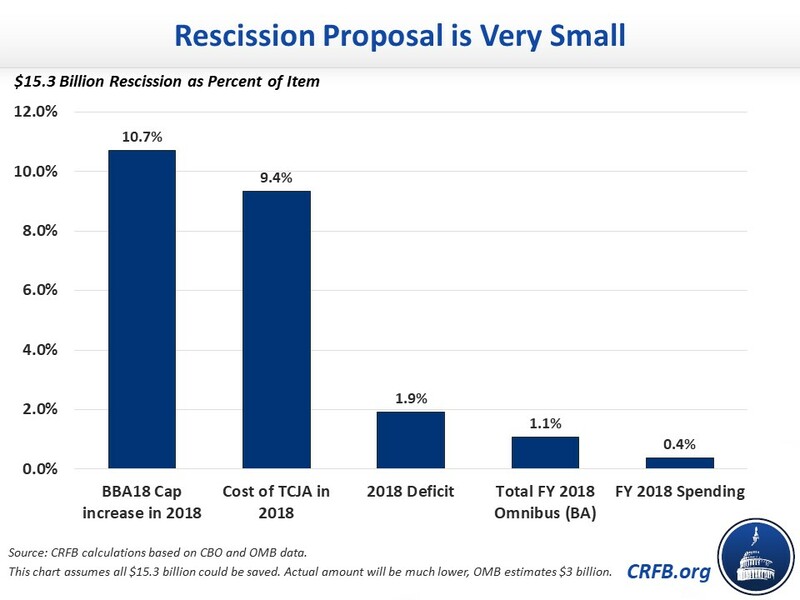 As in the case of CHIP (see update above), most of these rescissions would cut budget authority for money that will not otherwise be spent, resulting in no direct effect on the deficit. Of particular concern is $800 million of rescissions for the Center for Medicare and Medicaid Innovation (CMMI), which experiments with new health care payment models and is actually projected to reduce Medicare costs. In total, OMB has estimated the rescission package would reduce outlays and thus the deficit by $3.0 billion. Savings could be even lower if cuts to CMMI reduce actual outlays that would have otherwise been invested in ways that lower federal health spending. Even if all $15 billion of BA resulted in cuts, the impact would be quite modest. $15 billion represents 11 percent of the 2018 spending increase from the recent Bipartisan Budget Act of 2018, 9 percent of the 2018 cost of the tax bill, 1 percent of spending in the omnibus bill and less than half a percent of total federal spending. It would represent a 2 percent reduction in this year's deficit. Despite these small numbers, rescission packages have important value. They help policymakers to eliminate unneeded and unused funding, clearing away clutter in the federal budget. Even rescissions for funding that will never be spent can help by preventing policymakers from later using the funds to support new spending increases (we wrote in detail about this budget gimmick here). And as CRFB president Maya MacGuineas said recently, "getting in the habit of supporting spending cuts without putting the money toward new policies is a step in the right direction." As we explained last week, Presidential rescissions were proposed every year except one between 1974 and 2000. With trillion-dollar deficits on the horizon , it's time to again make rescissions a regular part of the budget process. The Joint Select Committee on Budget and Appropriations Process Reform should consider ways to make this a reality, including possibly giving the President some form of enhanced rescission authority. Proposals to do so generally change the process's default from needing Congressional action to enact rescissions to needing it to prevent rescissions from going into effect. Presidents Bush and Obama both supported variations of such authority. To be sure, rescissions can't solve our budget problems -- not even close. Fixing the debt will require not only cutting wasteful spending and tax breaks but also identifying significant new revenue and entitlement reforms. However, if policymakers start proposing and considering rescission packages, it would represent a small step in the right direction.